Boilers are the main source of hot water and heat in most homes. It is therefore important that they are efficient and reliable to ensure that they work on an ongoing basis. Any breakdowns can lead to unnecessary disturbances and inconveniences to your daily life. To avoid the inconveniences, you need to service your boiler on a regular basis. Detecting issues early enough gives you an opportunity to fix them before they can escalate into huge issues. Failing to repair the problems in good time can result into partial or total breakdown of the boiler. When this happens, you will be inconvenienced as it will mean going without hot water for some time or look for alternative options. To minimize the disruption and the cost of repairs, why not service your boiler? The level of efficiency is dependent on the installation and maintenance. Our technicians are experts in boilers and can identify boilers that have not been properly installed or maintained. They examine all parts of the appliance and replace any part that is damaged or not working as expected. Improper installations have a negative effect on your energy bills and boiler efficiency. A boiler which is not properly maintained emits carbon monoxide which leads to dizziness, headaches, nausea and breathlessness. In serious cases, the gas causes death and unconsciousness which are both fatal. It is no wonder that some people suffer the effects of carbon monoxide poisoning yet they do not know the root cause. This is why you need a professional to inspect and service your boiler to eliminate the negative effects which only an expert can identify and rectify. It is cheaper to prevent problems than to correct them and that is why you need professional servicing. Are you located in Castleford, Morley, Holbeck, Wetherby or Headingley? We serve these areas plus their environs. 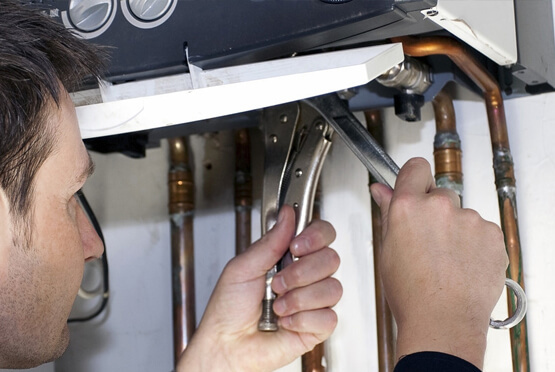 If your schedule makes it challenging to arrange for boiler servicing in Leeds, do not worry. Our technicians work round the clock and will be available to schedule servicing when you are available. If you have been diligent in servicing your boiler, the service can take as little as 30 minutes. Remember boiler servicing is good for old and new boilers. Reach out to us and get boiler servicing in Leeds.